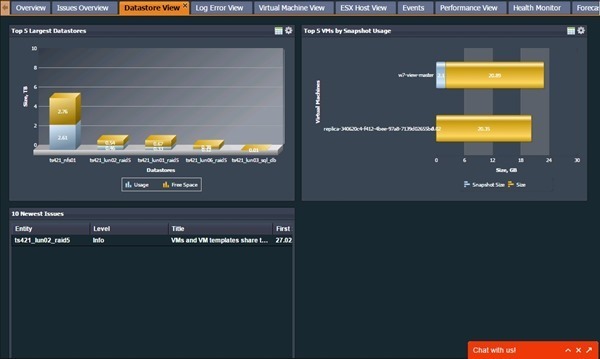 opvizor is a tool to diagnose and fix critical errors in your virtual environment and it is used as VMware health analyzer. 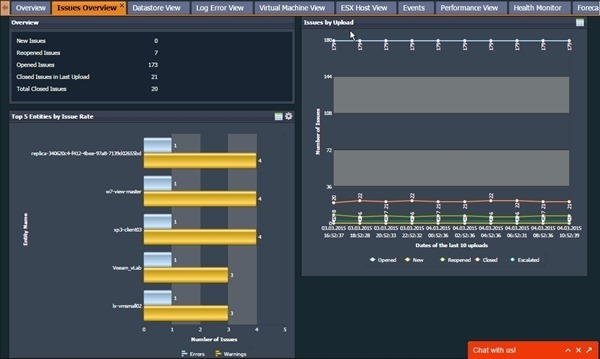 It provides a picture of every piece of the virtual infrastructure giving suggestions of what need to be fixed to achieve better performance limiting system errors. 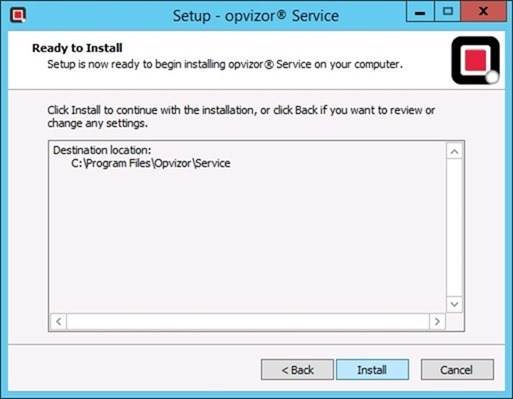 Since it's recommended to run opvizor service under a dedicated account, create in Active Directory the opvizor service account. 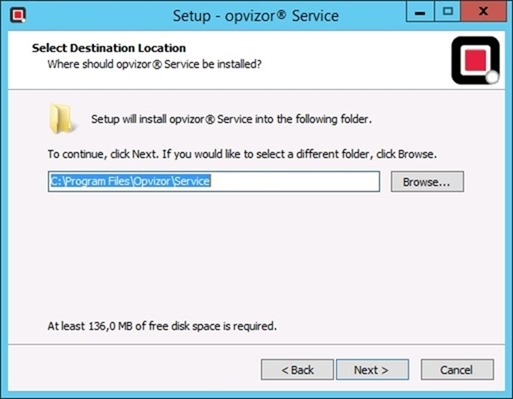 To collect infrastructure data, the service account used by opvizor needs some permissions in vCenter Server. 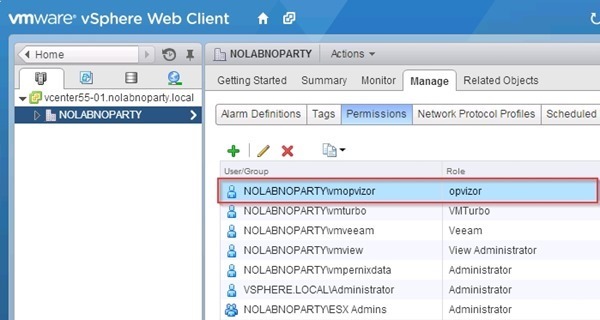 From vSphere Web Client access the Role section to configure required permissions. 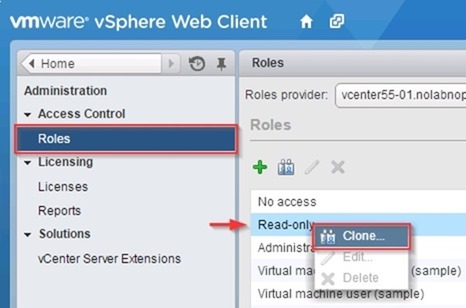 Right click the Read-only role and select Clone option. Give a Role name and add the permissions as listed here below. Click OK when done. The new role has been created. 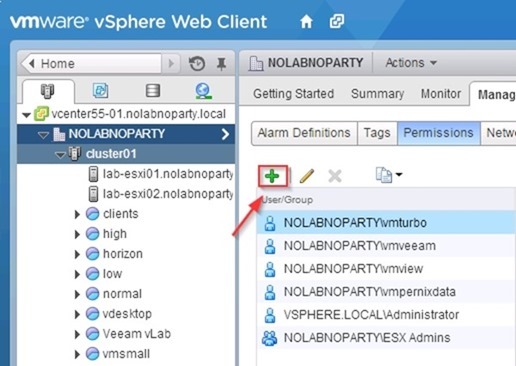 From vSphere Web Client, select the datacenter to analyze with the application and go to Manage > Permissions. Click on the green plus icon to assign the configured permissions set. 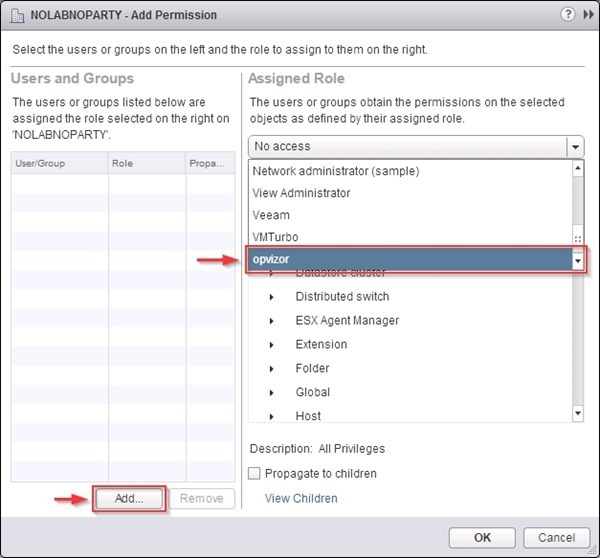 From the Assigned Role section, select opvizor role from the drop down menu. Click on Add button to select the service user account to use. 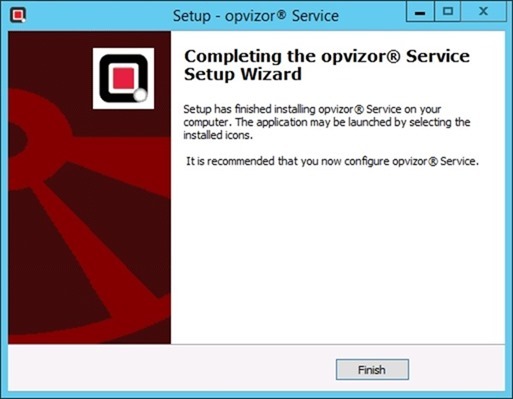 When the correct account and the opvizor role have been selected, click OK to save the configuration. The role has been assigned to the selected user. 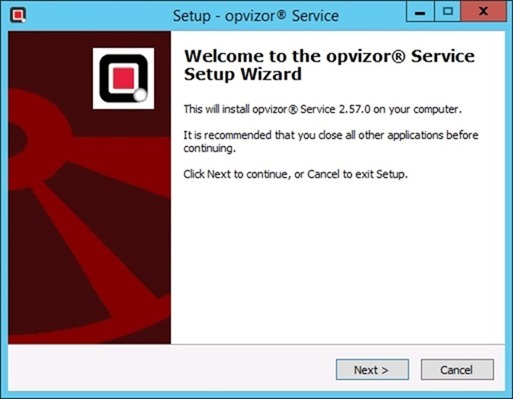 Login using the registered account and download from the website the opvizor service for Windows (opvizor-dist-2.57.0-WIN.exe) then run the installer. 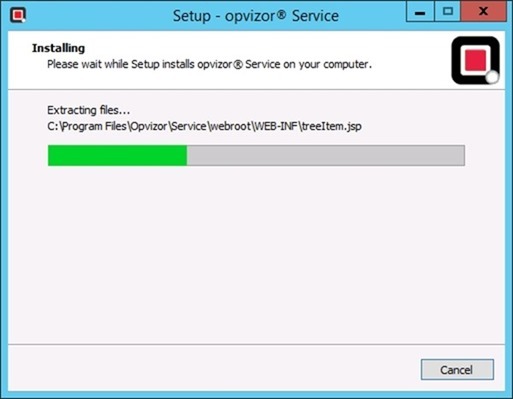 When installation wizard starts, click Next to continue. Leave default folder location and click Next. 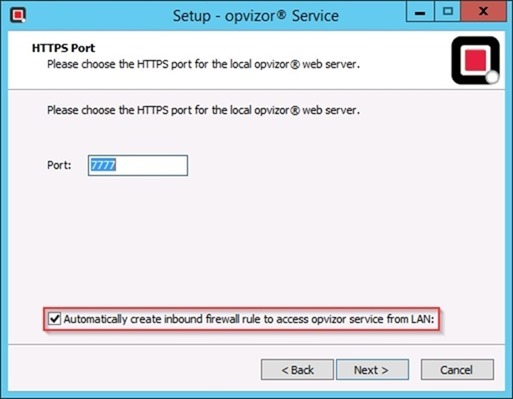 Enable Automatically create inbound firewall rule to access opvizor service from LAN option then click Next. 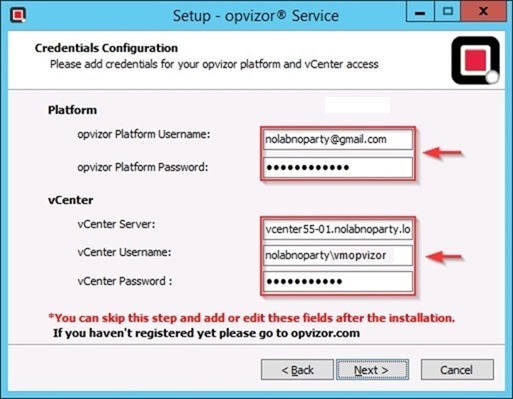 In Platform section enter the Username and Password used to register in opvizor website. 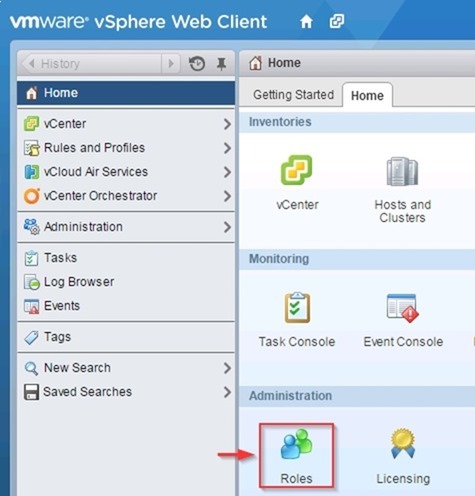 In vCenter section enter the vCenter Server and Username and Password of the service account previously created. If no proxy is used, select None item then click Next. The installation is being performed. 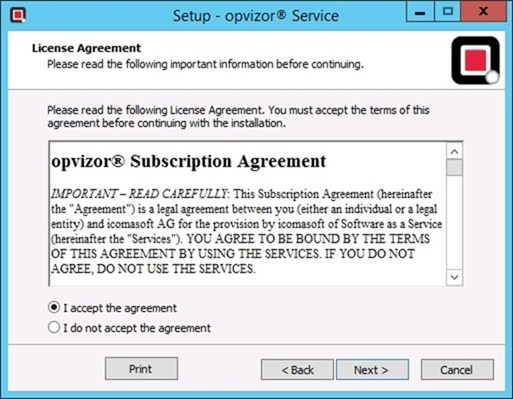 Access the opvizor Management GUI and check the configuration set. 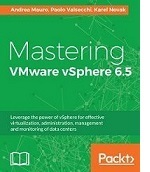 To provide data to analyze, click VMware Test Run for gathering data of vCenter Server without uploading to opvizor.com. 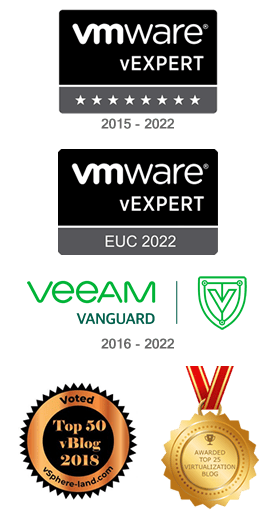 System starts crawling of vCenter Server. If the test succeeds, the green check icons appears in the right side. 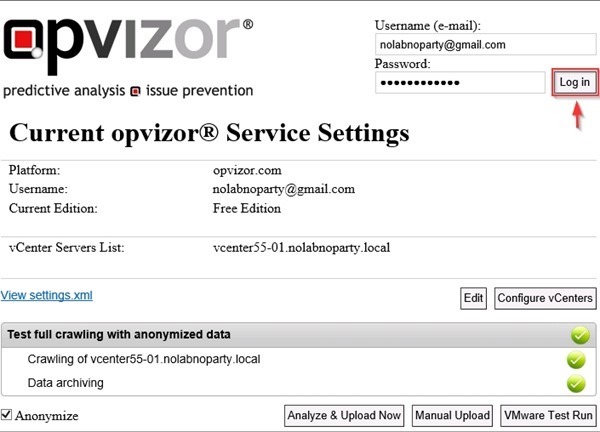 Click Manual Upload to send collected data to opvizor.com. Select the file with collected data and click Upload to send info. 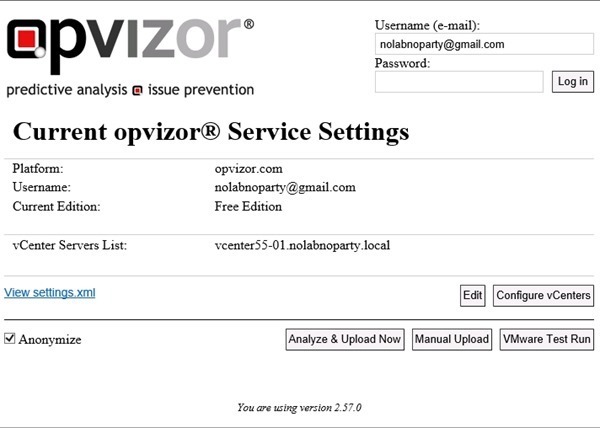 Once the file has been uploaded, opvizor start processing the data to show statistics and adjustments to perform. Enabling the Enterprise Edition, some additional options are available. 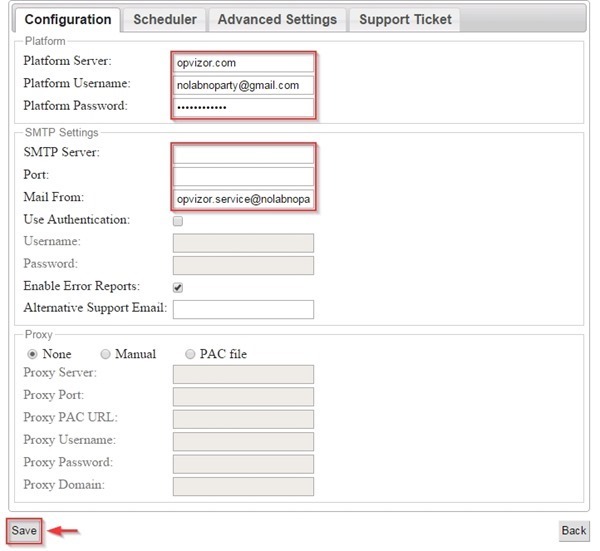 In the Configuration tab, check Platform parameters and fill the SMTP Settings. 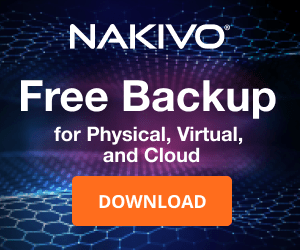 Click Save to store the configuration. It is recommended to schedule one full upload per day and, if requested, one incremental upload per hour. When done, click Save to store the configuration. 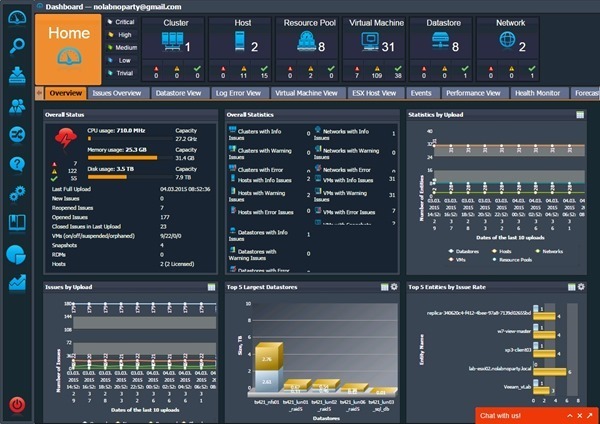 To access statistics and health status of the virtual infrastructure, from the web interface type the Username and Password of the registered user at opvizor then click Log in. The Dashboard is displayed with several tabs to analyze the status and the health of the overall infrastructure. 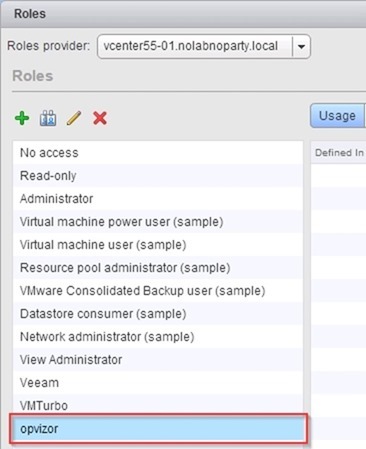 Select the different tabs to access specific areas of the virtual infrastructure. Statistics related to issues detected by the system during the data uploads. 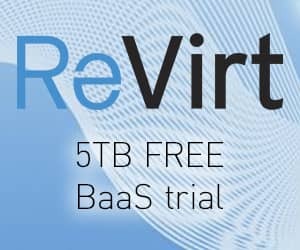 Info related to datastore usage, free space and issues are reported in this view. 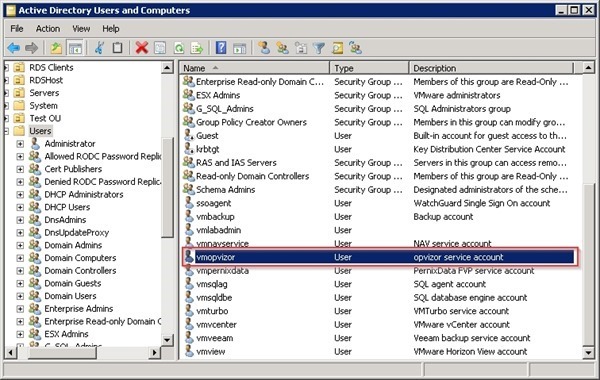 In this area, are reported all VMs statistics and issues detected. 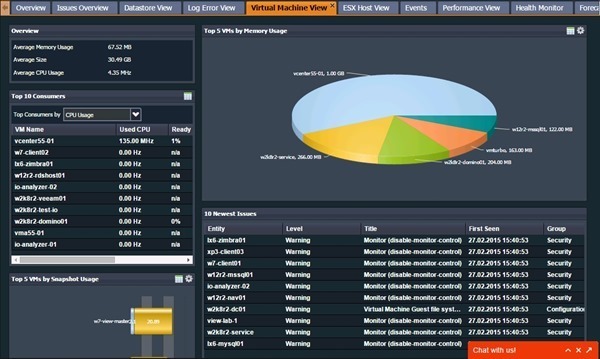 Numbers reported at the bottom of each area indicate the number of issues detected. Click on the issues number to display the details. The Level column with Errors value lists the issues that should be fixed to avoid system errors. Less critical issues are marked as Warning. Suggestions and optimizations are marked as Info instead. The application offers many other screens to deep investigate functionality and critical issues giving the exact picture of performance and global health status of the infrastructure.